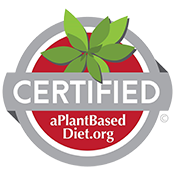 Based on research by Neal Barnard, M.D., one of America’s leading health advocates, the Kickstart program is designed for anyone who wants to explore and experience the health benefits of a whole plant diet. For more information, contact info@greenfare.com. Daily Lunch and Dinner Entrées – For 21 days you will receive lunch and dinner entrées; freshly prepared, delicious organic meals conveniently prepackaged to heat up at home or work. (4 Dinners at GreenFare during classes). 2 Blood Tests* – Scripts will be provided for blood testing at a local medical lab for fasting at the start and ﬁnish of the program. 2 Weigh-ins at the start and ﬁnish of the program. 1 Shopping Trip – Discover easy and affordable ways to sustain your new healthy eating habits with the guidance of your instructor. 4 Healthy Eating Classes – Learn some of our favorite methods for cooking delicious plant based meals. LAST DAY TO SIGN UP: 3 days before the start of class.